Received all my pictures a week ago and I must say that I'm really impressed with Abhishek and his team's work. The guys are very professional and innovative. Everybody is pleased with the way the pictures have been captured especially the candid ones. Photos taken were really good and even the editing was great . I would recommend Abhishek to everyone as a great wedding photographer . Thank you for the Review, Gaurav. We are delighted to have been a part of your most important day of life! It was a true pleasure shooting your Happy Family, our team was treated so well, with so much love! That helped us beautify your Wedding Memories! Really appreciated your words! Thanks. It has been a pleasure working closely with Abhishek and his team for all my photography needs for the wedding. Right from our first meeting, Abhishek was able to build trust, ensure that he understood all our requirements and made all efforts to accommodate all our special asks and desires. Not only did he and his team meet us several times during this process but were also very prompt and timely in reaching the different venues and ensuring full coverage as discussed in our package. Abhishek has been specially easy and wonderful to connect with as he not only took out time to understand our story together but made all edits/changes as requested and delivered everything well within time. Keep up the fantastic work! 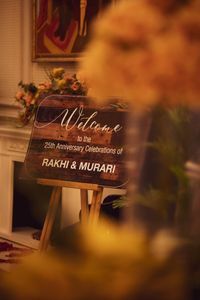 Your work is truly cherished as it helped us in building beautiful memories of all our three events - Engagement, Cocktail and Wedding! Thanks for the detailed Review, Shaifali. It was a pleasure to be a part of your beautiful wedding. It was very easy coordinating with you and you have been the most proactive bride I have seen by far as a result of which we were able to close your Wedding Deliverables timely. Thank for for the beautiful review! Thank you, Abhishek for the wonderful pictures and beautiful albums. You captured my sister?s wedding in a perfect way especially the details that you cover, just love them. I would like to mention that one incidence when you actually managed to get permission from Tivoli garden's manager to let you shoot my sister?s bridal wear at the same location as she had requested. Although there were many more locations available, you made sure to give your client what they want. Even post-wedding till the time you handed over the videos and albums, you were always available to make any changes we want. The experience with Abhishek and his team was really good and I am glad I chose him to shoot my sister?s wedding. Abhishek Dwivedi and his team are one of the sweetest guys you could work with! They are very passionate about their work and you can see this passion while they are working with you. That being said, we just have to praise the way they went above and beyond to capture our special day. Abhishek has outstanding candid photography skills especially in couple shots! He has covered my engagement on 11 June and the pictures have come out just wow! Im totally in love with the photos and cant stop gushing about them especially the ones with my fiance. Thanks for the amazing work Abhishek! I couldnt have found a more cooperative photographer than him. Thank you so much for such a beautiful and honest Review, Ananya! I am glad we succeeded in meeting your expectation. Thanks for being so cooperative as a couple, that helped us shoot your Engagement beautifully! We hired Abhishek for the candid photography of our three day wedding event and the whole experience was really good. He is very dedicated and has a very professional attitude towards his work. The best part about him was the understanding and taste of shots, colors and backgrounds was in complete sync to what we wanted. And this along with his hardwork has resulted in really amazing shots. All three days, he was very cooperative and very smartly managed to take those awesome shots becoming a part of our fun filled and chaotic family. 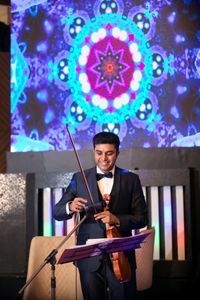 :D Thank you Abhishek for making our special event even more colorful so that we can cherish those moments forever and ever. We hired Abhishek to capture our engagement ceremony and he captured it really well. The best part about his photography is that he clicks pictures from multiple angles in which you look the best . He's very careful with the background while taking best shots.. We were blessed to have found out such a perfectionist photographer. He is punctual. We will recommend him to other couples as well . Thank you so much for the Review, Abha. We really appreciate it. I am glad to learn that we were able to meet your expectations. Thanks for the recommendation! It was a great photography experience with abhishek. I had appointed him for my wedding photography. Abhishek and his team have really done a good work. I owe a big thanks to him for making my candid portfolio so beautiful and to his team who have covered all the events and traditions in their own unique way. I would like to recommend him as a great photographer to all my friends for their events and parties. Thanks abhishek for those wonderful pictures which i can cherish for the rest of my life. Thank you so much for the Review, Shalini. Appreciate the attention to detail :) We're glad you loved our work. Abhishek Dwivedi and his team are one of the sweetest guys you could work with! They are very passionate about their work and you can see this passion while they are working with you. That being said, we just have to praise the way they went above and beyond to capture our special day. We had our engagement ceremony at Raddison Blu, in Ghaziabad, Delhi. We had many events and many guests to capture in a short amount of time, but Abhishek and his team made it a mission to capture every moment from every angle. They were able to capture all our memories of the day! We were surprised to see so many moments that we had missed otherwise! For making the album and video, we requested many edits, but Abhishek was able to incorporate all our wishes for editing and when we saw the finished product, we were amazed! The album is amazing and the video was so fun to watch! Such vibrant colors and such fun memories all captured by Abhishek and his team! Thank you Abhishek and Team! So we already had a personal connection with Abhishek since his sister is very close with my fiance and thus got the reference from there. And I can surely say that I did not regret it at all. Abhishek was professional, knew exactly what shots he wanted and someone having that perfect blend where it doesn't seem awkward at all shotting with him. That's saying something since I myself am slightly camera/posing shy. The same sentiment was echoed by our families around us. I would surely recommend him and look forward to seem him make it big in what is his passion inside and out. We had Abhishek and his men do the shooting for my brother's reception back in December 2016 and professionalism is what I liked the most. He is indeed passionate about the work and photos came out really good. We loved the album as well. Kudos to the team! I would definitely recommend this vendor! He is so professional and very responsive! Abhishek did an amazing job and we absolutely loved the way the pictures came out. That's the reason for hiring him for the photo shoot of another family function. Well we had Abhishek shoot our engagement back in April 16 n i was so in love with the shots that we had him shoot our cocktail in November.. Apart from the pictures being dreamy n full of life ( just as I wanted), the best part is the comfort level - like an old friend is shooting you. The way he passionately enjoys his work clearly shows! Welll it was my first time with the candid photography and abhishek left no stone unturned to make my engagement a memorable one. the dancing and the couple shots were so beautiful and admired by mine and the groom's family. He took our best pictures possible at the location, in every corner where possible. the added advantage of having abhiskek shoot your wedding is that he makes you feel comfortable and i felt a good old friend is shooting my engagement. From my dress to my sandals, the proposal, the ceremony, he captured all d details very nicely. I have already booked abhishek dwivedi for shooting my wedding and would recommend him to other couples who want their memories to be captured perfectly. Thank you so much for such a beautiful Review, Sakshi. It was indeed a pleasure to shoot your Engagement, followed by Wedding. Thanks to you and your family for making us feel like a family :) We're glad you liked our service!